The Heartfelt Love Of Little People. Free time to trial fabrics for a new quilt - I've been dreaming of this blue and purple combo since someone chose it for their Simple Sampler. Time to play with fabric -such a mothers day treat! New Arrival. Meadow by Leah Duncan Fabric for The Workroom - making me dream of summer English Paper Piecing. 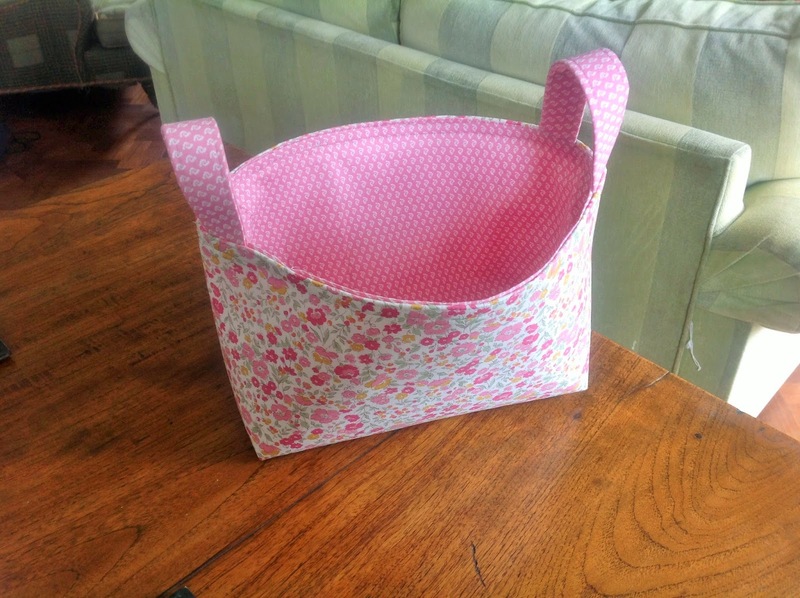 You know I love a bright summer EPP project and with a new class on the subject kicking off next month, it might be time to start planning for summer? So much lovely new fabric arriving at The Workroom at the moment. We're choosing really carefully. We want every bolt we buy to work really hard for you. When it comes to building your fabric stash we want to offer fabrics that will work in lots of projects. It's easy sometimes to fall in love with the marketing of a fabric range. Often a whole fabric range will be so perfectly put together that you'll want it all, but i'm a real advocate of mix and match. Hard working fabrics aren't always the star of the collection.Often they are the supporting actors - but heh, they'll do that job in LOTS of projects for you, their support lets your star fabrics sing, they are the glue in your colour scheme. I'm so excited about our expanding fabric range. I really think about it as designing the perfect stash for my students. We've just got in a whole load of Denyse Schmidt Ansonia and Florence prints, some Flea Market fancy (always a classic stash basic), some gorgeous soft Heather Bailey True Colours and Lottie Da and the iconic Lotta Jansdotter Mormor. We've also stocked up on solids and spots and soft greys and linens and all those great background fabrics. I'll be back soon to talk about our star fabrics too - we have some delicious irresistible prints coming in. I think some real classics in the making. Leah Duncans Meadow, Tula Pinks Fox Field, Jennifer Paganellis Lucky Girl. Come and see us, have a cuppa and a browse at The Workroom soon. We had a little competition to name our new Janome sewing machines at The Workroom. The sewing machines have been doing sterling work, whirring away on lots of peoples wonderful creations over the last couple of weeks. We couldn't leave them unnamed. Well done Claire who collected her fabric prize at The Workroom today after her winning suggestions of Elinor and Jo - the names of the author and the Head Girl at the Chalet School stories that my daughter is so fond of. Claire happily picked out some lovely Lotta Jansdotter fat quarters, and they've been flying out of the Workroom all day. I've just taken delivery of another exciting box of fabric, so i'm off to cut more fat quarters, and will share some phogs tomorrow if my Farmers Wife class leaves any for anyone else! I taught my fun fast fabric baskets class last night and more delicious baskets were being made, from fabulous Chickens to dinosaurs and sewing notion fabric to pretty florals. in the flesh - vibrant, modern and unmistakably Scandi. I love her fabric - i made this quilt with her last line. I really, really want to get straight on and make a quilt with it - but I might have to limit myself to another basket until some of those WIP get made! That's what I've been doing. What are you working on? I so love the Log Cabin block.It's super elegant. Perfectly designed, so straightforward to cut out and sew, but so infinitely variable. It's just patchwork perfection. This week we came to the end of our first Log Cabin Workshop. This was a new style of class for us. Three classes over 3 months, designed to allow our students to play and explore and innovate with this versatile block. We all have such busy lives, we get so 'deliverable' focused. 'Whats the outcome, what did i achieve?' We ask. Except life is a journey isn't it? You need to kick back and enjoy the process sometimes, to take the road less traveled. I hope that this class carved a little pocket of space in some peoples lives, to play, and take risk and try something new and feel that childlike pleasure in having a go. Kids play, kids have fun, we grown ups have to find our inner kid sometimes and lighten up and just let the creativity have a place to play! Here's just some of the lovely quilts getting made in this class, aren't they fab? I taught such a rewarding class this morning. One of the lovely things about having the workroom is that I now have the space to offer some really focused classes. Today we looked at hand quilting. All of the lovely ladies who joined me had tried this technique before, but hand quilting is so wonderfully old fashioned, in that it demands proper practice of the practitioner. It refuses to bend to the modern world by offering short cuts and quick fixes. It asks of us perseverance and patience! Eeek! Except it rewards that effort with a skill that will truly be special to you. When you can hand quilt you have an instant way to relax. There's something magical about being able to stitch in this way, and there's a huge amount of satisfaction in achieving something that's hard to learn. ............what is your sewing machine called? I have a sewing machine at home called Bernhilda. She's a Bernina and I like to think of her as a dependable solid sort of a lass, good in a crisis. My daughter has had a long obsession with the Chalet School books which were set in an Austrian finishing school in the 1930's and the place was chock full of these types learning DomSci and the correct way to execute a flat felled seam and the like. Miss Stitch has called her Janome, Janet. Another nice dependable name, there's a pattern here isn't there? We've just taken delivery of our two new Janome 525S 's for The PlainStitch Workroom. They are both currently sadly nameless. Can you name them for us? They are a bit racier looking than old dependable Bernhilda I have to say, if you're looking for personality clues in the naming of these girls. What was the name of your DomSci (domestic science) teacher? Do you remember her with fondness or dread? We'd love to know her name ( especially if she had one of those fearsome uniboob's that seemed to be de rigueur at the time). I can't promise any scientific winning formula, other than that the name passes muster with Miss Stitch who has some rather particular ideas about the dignity of naming a sewing machine.....if you can please her with a name you're a worthy winner! Good luck. Post your name in the comments or drop in and see us at The Workroom this week (Wed, Thurs and Fri 9am - 2pm) with your suggestion on a sheet of paper. We'll let Miss Stitch decide at the weekend. We'll send you 3 fat quarters if we choose your name! 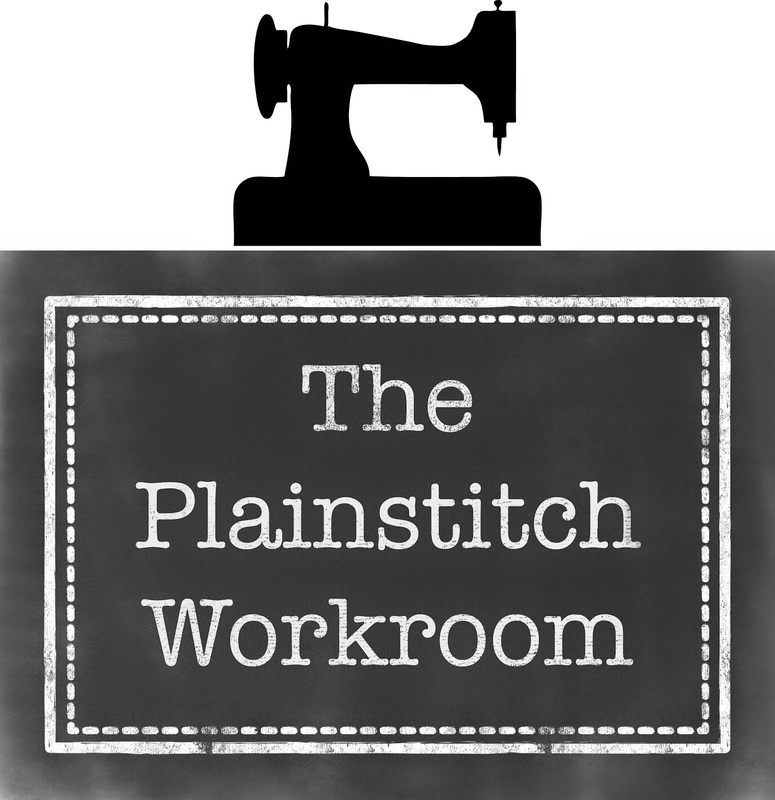 The Workroom - Come in and have a look around, why dontcha? This is a little post for my lovely sewing friends who aren't near enough to come and pop into the Workroom on Market Day here in our little village of Wendover in the Chiltern Hills. I have lots of lovely peeps who share our sewing from all over the world and I've had lots of requests for a proper nosey look around the Workroom now we're open for business. Some of you live a long way away, or nearby but busy busy, or are busy off, you know, giving birth and so forth ( hope baby makes an appearance soon Midlands friend! ), or living the dream in Somerset ( we miss you!) ...anyway here is my little tour around our lovely Sewing Home! When you push open the gate you come into our little hidden courtyard. We are really quite giddy about the prospect of summer and outdoor sewing here, hidden away in the heart of the village behind the busy High Street - yummy indulgence! We are awaiting very grown up iron railings for our very wonderful stone steps. Don't they make you feel just a little bit Jane Austen-ish when you arrive with your sewing? Anyway, if you've resisted the urge to have a little sit in the sun, do ring our bell and come in and up the stairs and into our sunny Workroom, here's our little free motion embroidery wreath on the door. ( We're having a new bell fitted this weekend - the current one is very faint so feel free to knock too just to make sure!). My attempts at free motion embroidery are a little bit spidery, but we have a fabulous class lined up for the autumn run by a very talented local lady who can literally draw with her sewing machine and she'll be teaching us all how to do that too... more details coming soon. This is our ironing station. Isn't it fab? It's right next to the big sash window so you can watch the world go by on the High Street as you press your blocks - lovely! Oh and have a sneaky jelly baby from the supplies cart underneath to keep the sugar levels up! So this is our Workroom. Lots of quilts, lovely fabric, patterns, lots and lots of fat quarters - we pride ourselves on having oodles of them pre cut so it's easy to mix and match your fabric choices when you come to a class. We love fabrics strewn across the table, try them out! It's bright and light in the Workroom so easy to get a true 'read' of fabric colours - there's nothing worse than trying to buy fabric in gloom, the colours look so different. That's my pin cushion basket in the middle of the table, i'm adding a new pin cushion just about every week at the moment! It's a way to stop myself trying to make a full quilt of every fabric bundle that one of my customers pulls for their project that gives me the 'wanties'! We make our own lampshades, so much fabric fun, we have a class on Fri 4th April 10am to learn how if you'd like to make your own. Our super comfy chairs are vintage Ercol. We are based less than 5 miles away from the Ercol factory. We love where we live and we love local, so we're proud use these vintage examples of the rich crafts tradition here in the Chilterns. This is our peg board shop of notions. I love a peg board - it reminds me of my Grandads garage with all of his carpentry tools neatly lined up on a peg board ready to create. We have lots of fab fabrics and we're adding to our shelves every week. We're really picky about the fabrics we choose, we try and edit to suit our customers, we go for prints that really work hard for you in a design. This week the Workroom has been a hive of activity! Our freshly 'first coated' front door has been welcoming so many lovely visitors. We've had lots of new classes kicking off this week. I do so love the start of Simple Sampler - the anticipation of soon-to-be-quilters getting excited about their first quilt. We've done lots of fabric choosing - our favouite thing! We've suffered a lot of 'bundle-wanties' as gorgeous combinations get picked out and wrapped up and spirited away for someone to get started on new exciting quilt combination. We've had lots of lovely visitors, bearing flowers ( aren't we lucky? ), and wishing us well. We do feel very lucky to be at the heart of such a wonderful group of people. Thank you. My sewing time has been squeezed out by my second most favourite job, cutting and arranging fabric bundles! But I did make time to turn this little wonky log cabin demonstration block, that I whipped up in my Log Cabin Class last week, into a pin cushion. I'm collecting them at the Workroom. They are very moorish! Come and choose your favourite to use when you sew with us! I did find time to start cutting into this lovely bundle which I have special plans for which I'll share when I get started on actually sewing it! Come by the Workroom this Saturday and say hi, we'll be open from 9.30am- 3pm, maybe making pin cushions!